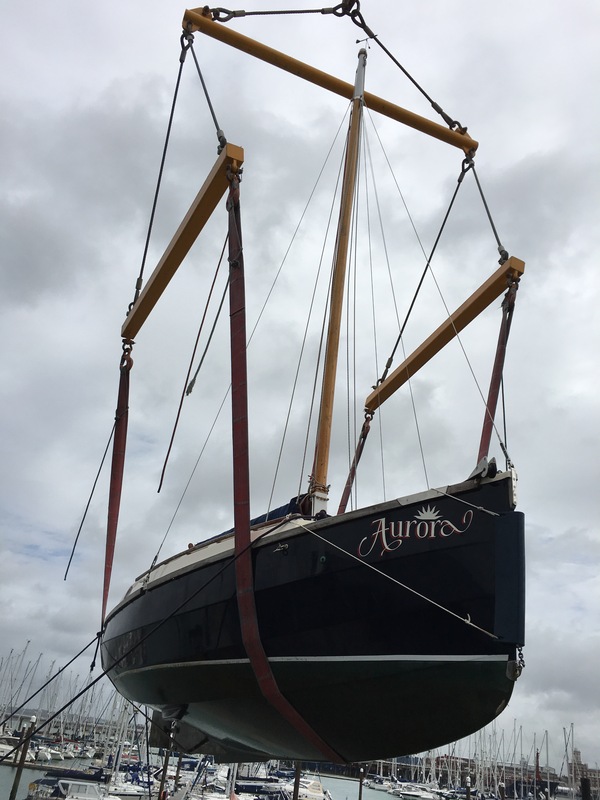 This blog is named Traveling Aurora for a reason; this is the first season we’ve not trailed her from place to place, but instead kept her on a mooring. The plan was for more weekend trips, exploring the Solent instead of towing her to a variety of cruising grounds. Sadly though, work and family pressures have kept the sails furled more often than I would wish. However the trips we have made were memorable nonetheless and I have learned much, particularly about mooring matters. Aurora’s mooring was one that dries at spring lows and is about 8 mins tender drive from the slipway. One recurring problem had been one of a stuck centre plate. I spent quite a bit of time trying to free it during our week in June, culminating with fitting an access hole on the top of the centre plate casing to allow (the blunt end of) a chisel to be applied to the centre plate to “persuade” it down with a hammer. Despite enthusiastic walloping, this has met with no success. 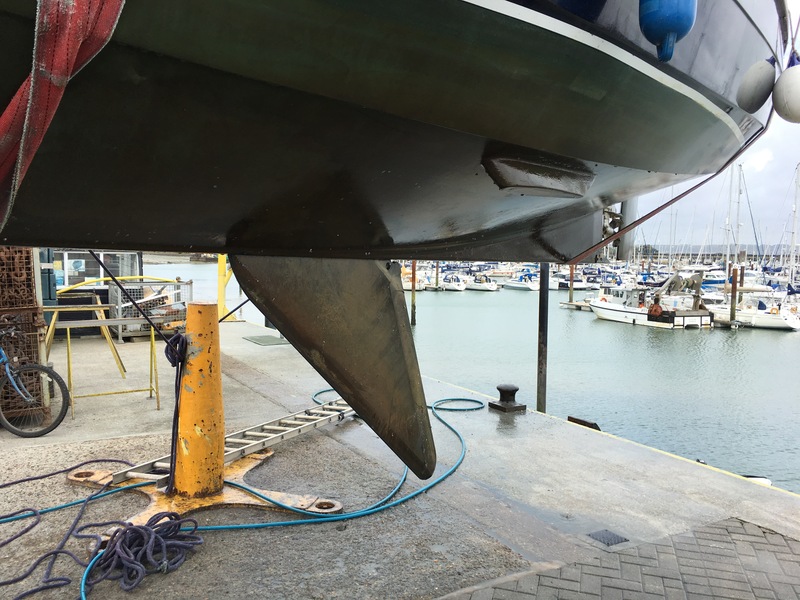 The next stage was of course to haul the boat out and work on the centre plate from below. I spent a (perfect sailing) Saturday trying to free the plate. By inserting a hacksaw blade between plate and casing, I could feel numerous small stones wedging the plate stubbornly in place. A number of them were removable, but others were impossible to winkle out because of the rollers on the trailer and the limited access working under the trailer. When the boat was returned to the water, my hopes of the plate dropping were still denied. Finally, I was left with no alternative but to pay for Aurora to be lifted. Chris Haddock of Gosport Boat Yard (www.gosportboatyard.co.uk) was very helpful and waved away any doubts that my troublesome plate would pose any difficulty to free off. Indeed he was quite right and, after a quick jet wash, the back of a hand saw inserted between plate and casing popped the remaining stones out surprisingly easily and the plate dropped like the proverbial sword from the stone. Now, though Chris did me a good rate for this job, I don’t want to have to lift Aurora regularly. It seems that everyone who had had a boat on any kind of drying mooring has a story to tell of stuck centre plates. I had assumed that raising the centre plate fully when mooring was the order of the day, but advice from Bob Steele (Irene) was that it is better to pay out an arm’s length of plate halyard so that the plate moves up and down a little each time the boat takes the ground. This certainly helps, but does not prevent the plate sticking still from time to time. It seems the only solution is a deeper mooring and I am very glad that the was a spot close by with a couple more feet of water and Aurora will not need take the ground on a regular basis.